Are your tired of the same old color? Does your hair need that special spark to make it shine when you walk into a room? Maybe it's time to consider getting highlights. Gravity Hair Studio in Brooklyn, NY, has talented stylists who are experts with hair coloring, highlights, and haircuts. If you aren’t ready to change your entire color, highlights will be perfect for you. The wonderful part about highlights is you can add rich, warm tones to your hair without having to change the overall color. There are so many different kinds of highlights, making the possibilities endless. Balayage: With this look, your stylist will place color in your hair where the sun would hit it most. This will give you a natural, bright pop of color. Ombre: Ombre comes from the French word for shading. Ombre coloring will start with a darker color at the roots and gradually fade into a lighter color as it reaches the end of hair strands. Babylights: This style of highlighting is reminiscent of the natural highlights you had from spending time in the sun as a child. The super fine lines of color frame the face perfectly. Chunky: Chunky highlights allow you to add large streaks of color while still maintaining your base color underneath. Slicing: This technique is opposite from chunky, and allows your stylist to add only very thin “slices” of color throughout your hair. Lowlights: This is a great option for people with lighter color hair such as blond or light brown. Lowlights add a darker color to add dimension and depth. 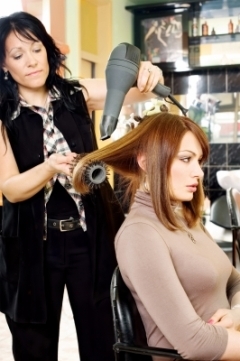 Whatever your style is, the highly skilled beauticians at Gravity Hair Studio will be able to give you the perfect highlights that will accentuate all of your best features. For their full list of services, visit their website, or to make an appointment, call (718) 975-2910.